Northwest tribal leaders say they’re giving their support just as tribes from around the U.S. helped in their battles for fishing rights here in the 1960s. Hours after the march, a court temporarily blocked work on the pipeline. With song, prayer and thundering drums, hundreds of tribal members from around the region and their supporters marched Friday to demonstrate their support for the battle of the Standing Rock Sioux against an oil pipeline under construction through ancestral tribal lands. They won at least a short-term victory late Friday: The U.S. Court of Appeals for the District of Columbia blocked the developer, Dakota Access LLC, from further construction on the lands the tribe seeks to protect, for 20 miles on both sides of the Missouri River at Lake Oahe, pending consideration of an emergency injunction to stop construction and other legal proceedings. Tribes from across Washington and the Northwest have journeyed to remote Cannon Ball, N.D., to join hundreds of other tribal nations in peaceful occupation of the lands where the Standing Rock Sioux seek a federal court order to stop construction of the pipeline until the tribe’s waters and cultural resources are protected. 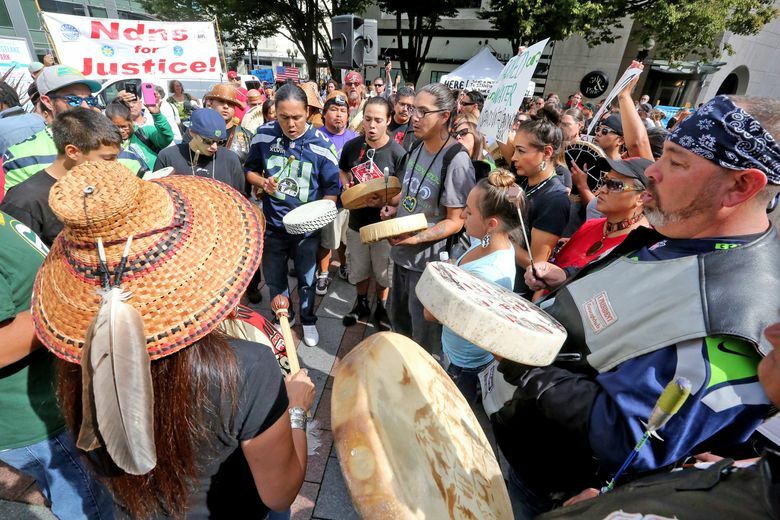 Friday, tribes took that cause to the streets of downtown Seattle, saying they were standing up for the Standing Rock Sioux just as Indians from around the nation had stood with them during the “fish-ins” of the 1960s, helping defendtreaty-protected fishing rights. Seattle Mayor Ed Murray kicked off the march outside City Hall by signing a proclamation in support of the Standing Rock Sioux on behalf of the City Council and people of Seattle. Councilmember Debora Juarez, a Blackfeet Indian, also declared her solidarity with the fight against the pipeline. 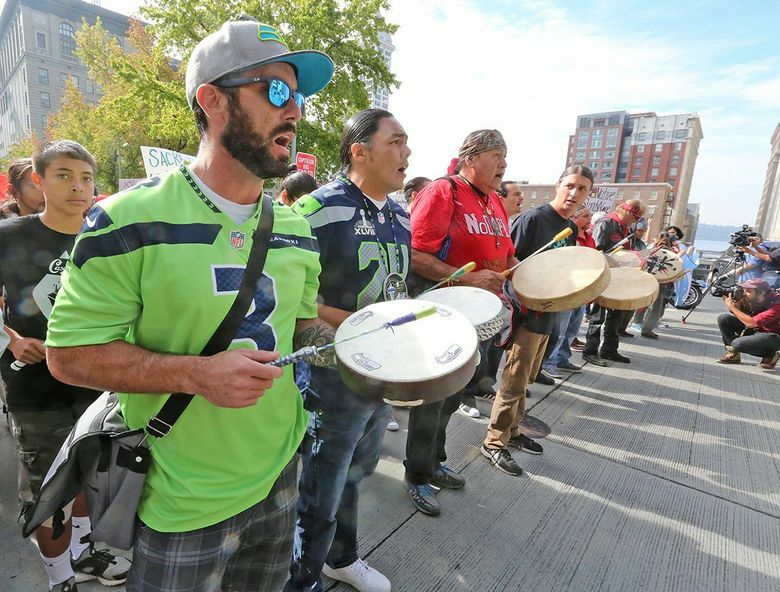 As they marched from City Hall to Westlake Center along Fourth Avenue, the songs of drummers and singers echoed off the tall buildings of downtown. Some protesters wore their finest white buckskins and splendid beaded regalia; others carried eagle-feather fans and carved rattles. “Water is life! 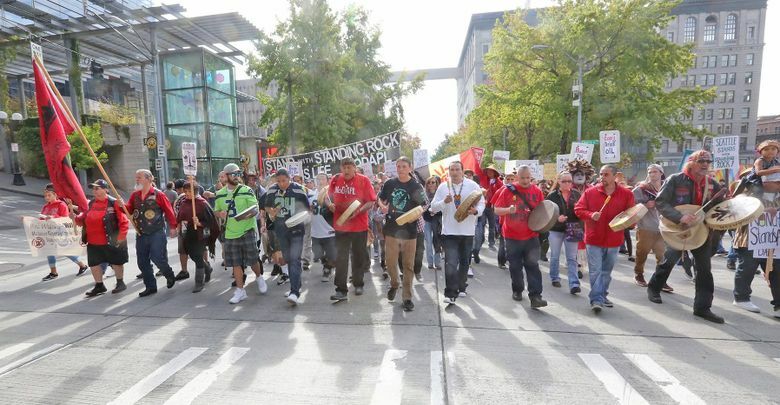 Water is life!” tribal members shouted as they marched to Westlake Center. 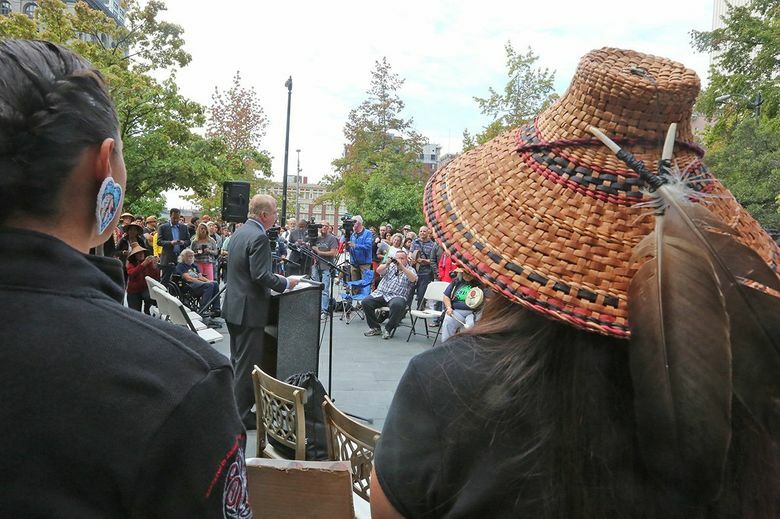 There, Fawn Sharp, president of the Quinault Indian Nation and the Affiliated Tribes of Northwest Indians, sounded a call to action. “I call on the voices of our ancestors and children yet unborn; we stand on sacred trusts. Do you feel that power? The power of our ancestral teachings?” she asked the crowd, which thundered its affirmation with voices and drums. She decried the use of dogs and mace by a private security firm against tribal members seeking to stop the bulldozing of cultural sites by company contractors over Labor Day weekend. “When a private security company can (use) dogs against us, that’s an assault on all of us,” Sharp said. Video of the confrontation, made by reporter Amy Goodman of Democracy Now, has gone viral. Tom King, a former director of the office of cultural-resource protection for the national Advisory Council on Historic Preservation, said the destruction of the site “appears to be a direct, obvious” attempt by Energy Transfer Partners LLP, the developer of the pipeline project, to destroy an important archaeological site in the path of the pipeline, rather than be required to protect it. If that is found to be so, it could by law disqualify any agency from allowing the project to proceed, King said. “It’s amazing, the most dramatic and stupid example of this kind of thing I have ever seen,” said King, who traveled as a volunteer to the site and worked with tribal cultural-resources experts who described it in court papers filed Sept. 2. The bulldozers arrived the next day. Pipeline construction was temporarily paused Sept. 9, as federal agencies declared the need to review the project anew and create a new process by which such projects are evaluated. But until the pipeline is permanently stopped, tribes say they won’t be satisfied. The encampment meanwhile continues to grow and attract supporters of all races from around the world. “No one is leaving,” said Jan Hasselman, of Earthjustice in Seattle, the lead attorney for the Standing Rock Sioux. “People come and go, people are still arriving, there was a delegation of Maori people from New Zealand, and Amazonians from Ecuador.” The crowd at the so-called spirit camp is estimated in the thousands. He has filed an emergency injunction and other actions in federal court to block further construction of the project. The pipeline is planned to take crude oil from the Bakken oil fields in North Dakota to Illinois and cross the Missouri River just upstream from the Standing Rock Sioux reservation. The pipeline will pass through North Dakota, South Dakota, Iowa and Illinois. The tribe argues that drinking water and sacred sites on its 2.3 million-acre reservation are at risk from the pipeline, as are thousands of residents on the reservation and millions of people who rely on clean drinking water downstream. The United Nations Permanent Forum on Indigenous Issues is calling on the U.S. government to allow the Standing Rock Sioux to have a say regarding the $3.8 billion pipeline, which has been under construction since last spring, with no environmental-impact statement or comprehensive permit review having been conducted. Thunder High Clouds (Hanford McCloud) of the Nisqually Tribal Council was in the protest march Friday, having just returned from a canoe journey on the Missouri River with other Nisqually paddlers in eight canoes they trailered 1,200 miles to the river, to show their support for the Standing Rock Sioux. “They wanted us to bring those prayers, that sense of what we do in the canoe journey,” High Clouds said. For two days the paddlers traveled 40 miles on the Missouri before landing at Standing Rock. “They were excited to see the coastal canoes come; that river there is their lifeline, just as ours is for us.